It was 2002. I loved wearing clothes featuring monkeys and light-up shoes. My class took a field trip to The Forks in Winnipeg, and I got to be one of the 114,000 people to see the Golden Boy up close while he was down from his usual perch on Manitoba’s legislature building for repairs. My eight-year-old brain immediately figured that he was the biggest statue on the planet. Fast-forward 17 years, and I still think the Golden Boy is amazing (although I’ve learned that the planet extends beyond Winnipeg’s Perimeter). He’s always there, rain or shine, in the heart of our city. And this year, he has a special birthday coming up. 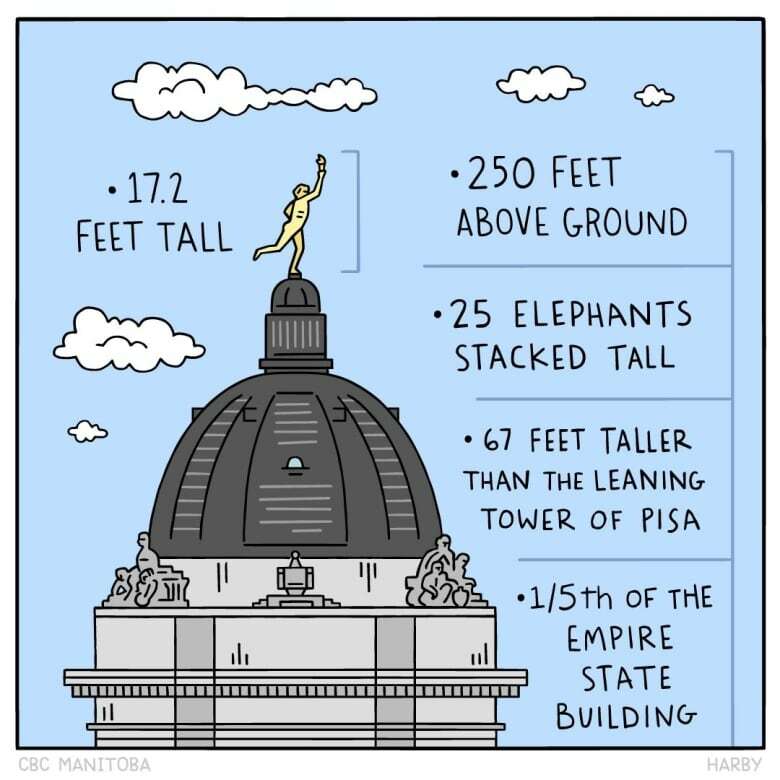 As of Nov. 21, 2019, the Golden Boy will have stood atop Manitoba’s legislative building for a century. Earlier this month, the province announced it is investing in extensive renovations on the building itself. That means improvements like new metalwork, addressing water leaks, replacing mortar on stonework. 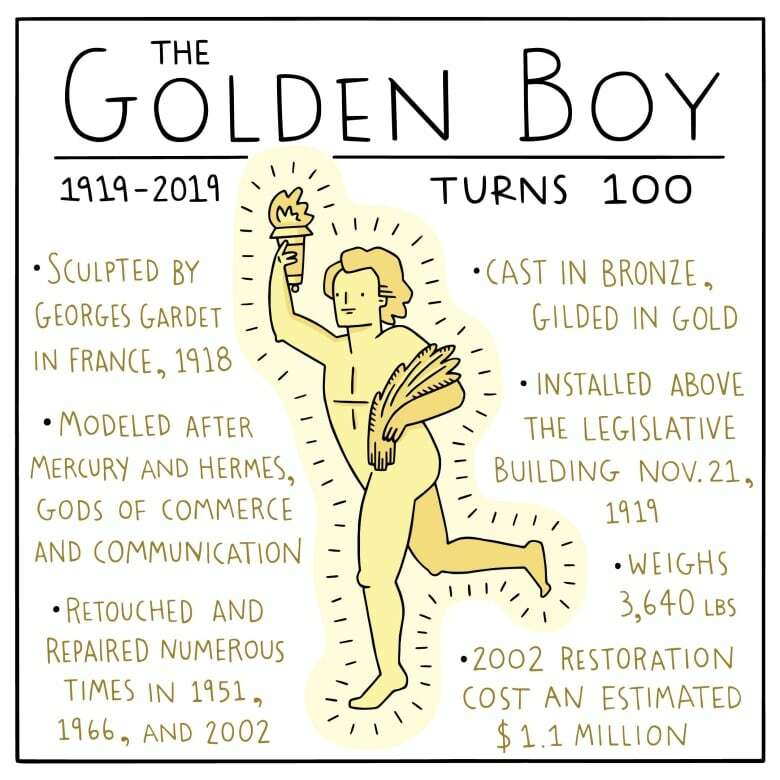 Despite being 100 years old, though, the Golden Boy won’t see any of that money, since he had his major makeover in 2002. It’s been 17 years since my date with the Golden Boy. I still see him when I walk by on my way to and from work. It was on one of these walks that I wondered: what does he look like now, up close? Turns out the province gives exclusive tours that bring visitors to within metres of the Golden Boy. Here are the steps you have to take to get so close to the man himself. Door 371 in the Manitoba Legislature is the portal to the Golden Boy. It’s unassuming and looks like every other door in there. But once I walk through, I immediately feel like I’m in a castle, as I travel up a concrete spiral staircase enclosed by tight, rounded walls. My tour group, consisting of provincial spokespeople, ends up in a room that houses the dome. If you stand on the Pool of the Black Star in the legislature’s rotunda and look up, you’ll see a painted dome above you. This dome’s exterior is what I see when I finish climbing the first set of stairs. This side of the structure isn’t covered in ornate carvings or blue, white and yellow paint, but a different type of art. Thousands of visitors’ signatures cover the structure. You see, this section of the legislative building isn’t part of public tours. If you’re up here, you’re here for a reason. Maybe you just got elected as an MLA. Perhaps you’re a professional who’s fixing the metal work. Maybe you’re a journalist who got curious on her walk to work one day. 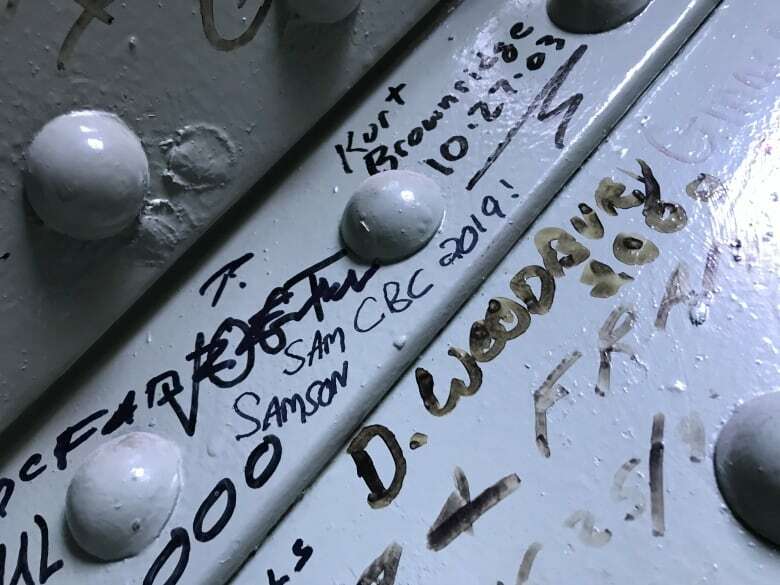 To mark the occasion, I’m allowed to sign the building anywhere I want. 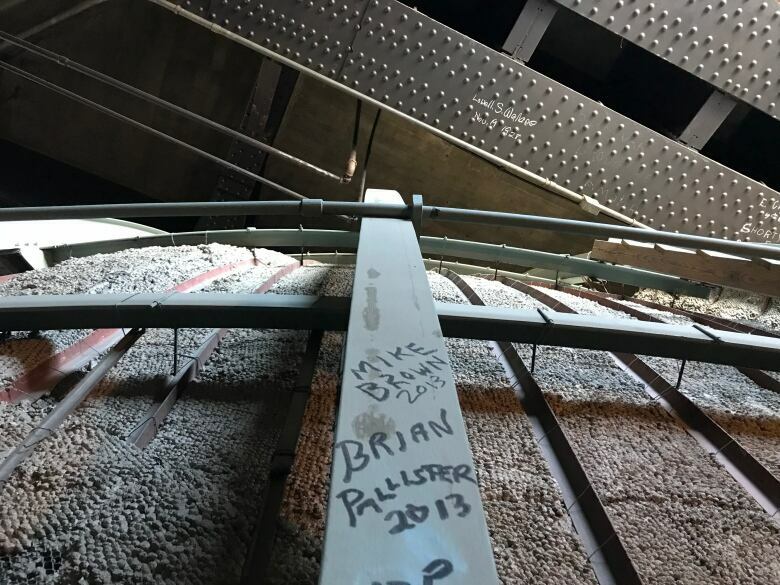 This tradition has created a mural of permanent-marker and pen signatures all over the dome and the walls. Premier Brian Pallister’s signature is one of the first that I see — after I crane my neck up. Many signatures had messages like “keep going!” and “almost there!” and I can see that the “Friendly Manitoba” slogan lives on here — in Sharpie. After climbing a second set of stairs, I get to a room that floors me. This tall, sunny, open room is the tower that’s visible from outside. There’s a glass dome in the centre, which is actually the top of the dome that you can see from inside the building. There’s also scaffolding set up in one corner. A dozen tall windows allow sunlight to waft through the dust in the air. It helps me see the built-in arches in the four walls and the thousands of signatures on the bricks. What really catches my eye is the metal spiral staircase in the corner of the room that connects to the floor and disappears into the ceiling. This is where the fun begins. But for many, it’s where the journey ends. My tour guides tell me that this is high enough for visitors who are afraid of heights and don’t want to tackle the staircase. And I can see why. The staircase is completely open with a thin metal railing. You can see exactly how high you are — and how far away the ground is. The final room awaits at the top of the staircase. It’s dark, musty and cold. I’m now in the dome that the Golden Boy stands upon. The only objects in the room are a set of stairs and an insulated shed. When the Golden Boy was brought down for repairs in 2002, the province installed sensors on the statue. The sensors monitor the statue’s well-being by measuring vibrations and our harsh prairie weather. The shed in this room houses computers that collect this data. The province says they use this information to gauge when the statue will come down next for more repairs. The final set of stairs includes some vertical ladders that I use both hands to climb. When we reach the top, we pop open a small hatch in the roof of the dome. I climb up to the second-highest rung on a metal ladder. Grabbing onto the handle of the hatch door, I have to turn around and lean back. And there he is. I’m still several metres from him, but the Golden Boy shines brilliantly in the sunlight. From this viewpoint, the gold leafing looks intact, and he looks as proud as ever. So happy birthday, Golden Boy. You don’t look a day over 99.